Following last night's Golden Globe ceremony in which "Three Billboards" and "Lady Bird" dominated the film award categories, Hollywood Reporter's Scott Feinberg updated his Oscar predictions. Again, "Heroin(e)" produced and directed by WVU grad Elaine McMillion Sheldon tops the list. 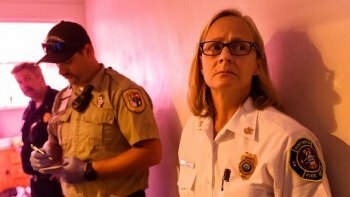 In fact, the Reporter's website contains a new still featuring Huntington fire chief, Jan Rader. In the Best Picture category, Feinberg's front runners are: Get Out, Three Billboards, Shape of Water, Dunkirk, Lady Bird, The Post, Call Me by Your Name, Florida Project, The Big Sick, and I Tonya. He considers "Mudbound," "Darkest Hour", "Phantom Thread" and "Wonder Woman" major threats and possibilities are "Molly's Game," "Blade Runner 2049," "Greatest Showman" and "Wonder." Longshots? All the Money in the World, Downsizing, War of the Planet of the Apes and Mother!